As I mentioned here a few months ago I was able to score some great old photo albums on ebay. I must admit that I got carried away and spent more than I should, but I just felt drawn to these albums. My hope is that one day I will be able to get them to family that will treasure them. So today I will feature some items in one of the albums in the hope of connecting with someone and to honor a military hero. 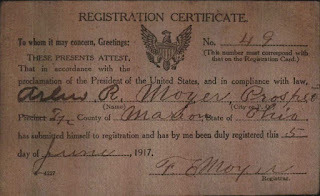 Arlus Ruben Moyer was born in Prospect, Marion County, Ohio on October 21, 1895, to Frank and Ada (Kirts) Moyer. 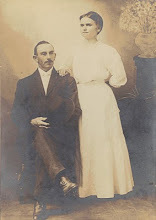 He had an older sister, Ruth, born March 24, 1894. The above registration certificate is glued into the photo album. Arlus registered for World War I on June 5, 1917. 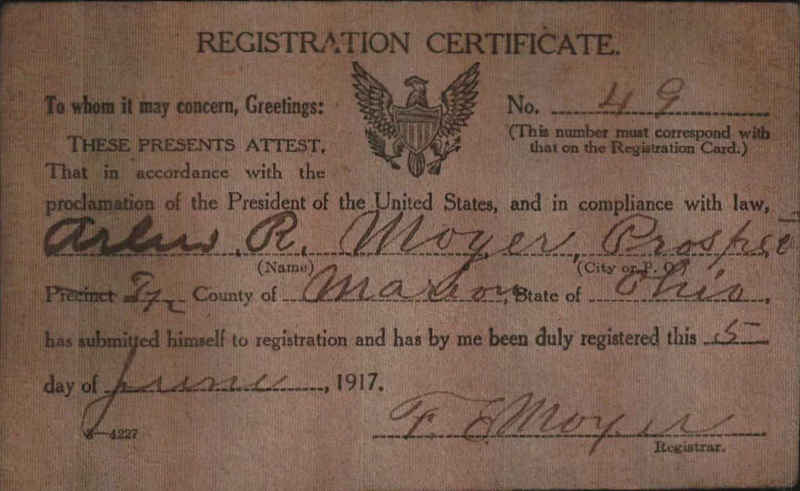 Note that his father was the registrar. 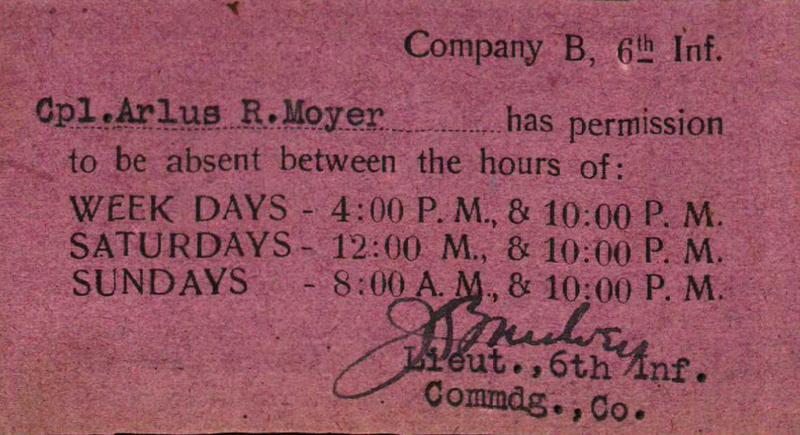 According to the book Ohio Soldiers in WWI 1917-1918, it appears that Arlus joined the military on October 6, 1917, though it is unclear whether he was drafted or chose to enlist. 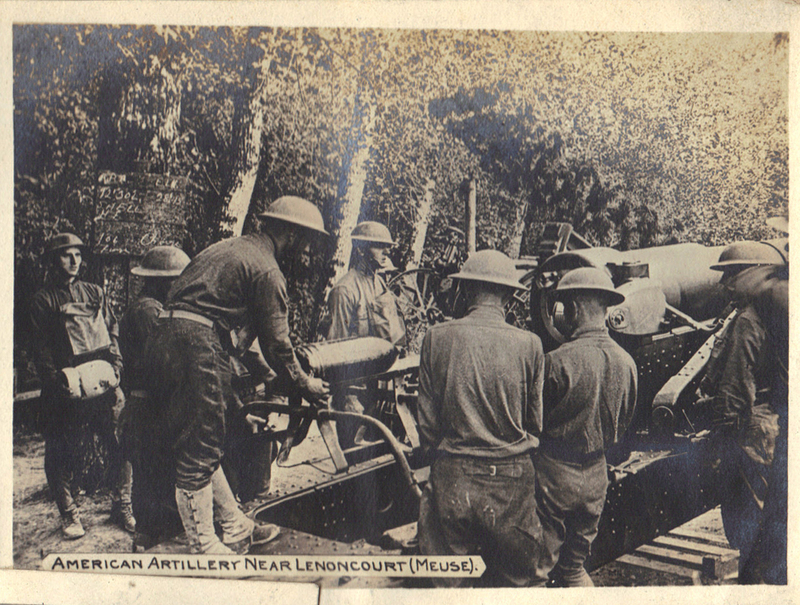 Arlus served with the 158th Depot Brigade, out of Ohio from his enlistment to February 24, 1918. He was then transferred to Company B, 6th Infantry Regiment, 5th Infantry Division. He was a bugler and was promoted to Corporal on March 22, 1918. 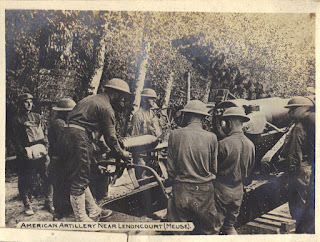 Arlus was at the two large battles at St. Mihiel and the Meuse-Argonne and was overseas from April 19, 1918 to July 22, 1919. He was honorably discharged on July 30, 1919. 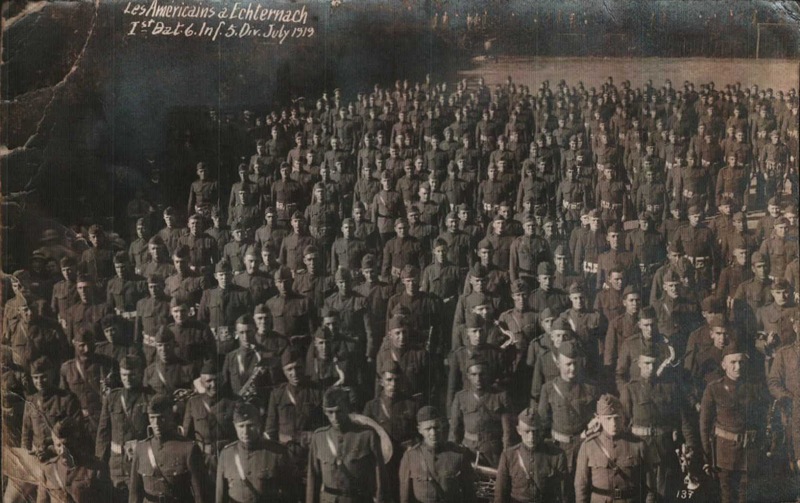 1st Battalion, 6th Infantry Regiment, 5th Infantry Division, July 1919. 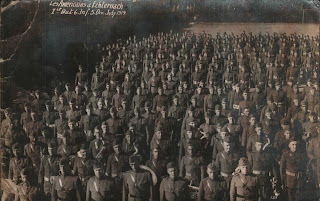 Presumably taken as the Battalion prepared to return to America. 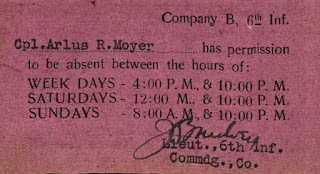 A leave pass which seems to give Corporal Moyer the run of the land. 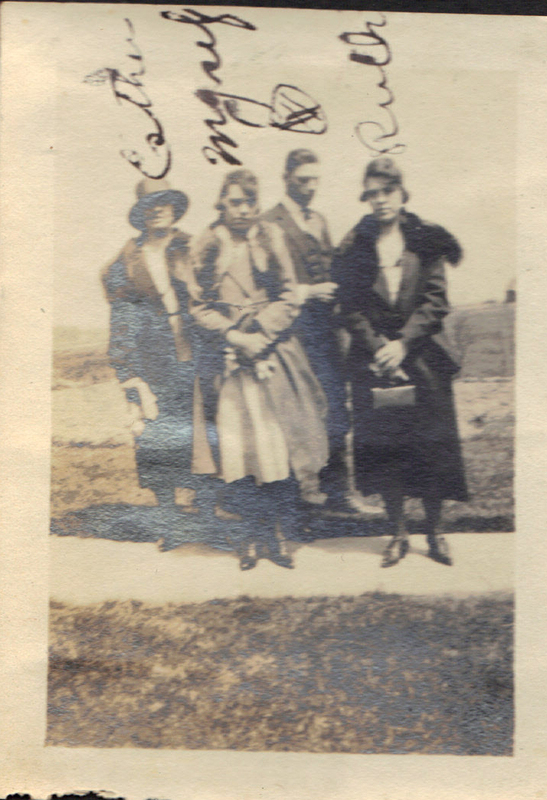 The photo album includes several mementos from Arlus' service and many family photos. Unfortunately, the photos are pasted into the album and I'm a little leery of pulling them up. I believe that the Soldier in the photo above is Arlus Moyer. I also think that the four women are all related to each other because their faces all have the same shape. In the above photo I believe that "myself" and Ruth look so much alike that they could be related. Arlus' first wife was name Esther and his sister was Ruth but there are too many women in these photos for me to make connections based on the information I know. The second half of the photo album is filled with military action photos. Each one is generic and they were probably available for purchase to Soldiers overseas. Arlus Moyer died in 1961. His headstone states that he earned the Silver Star, a very prestigious medal for bravery. I'm not sure how he earned this award, but I am very proud to have this album of keepsakes from a hero. If you know anything about Arlus Moyer or his descendants I would love to hear about it and try to return this album where it belongs. What a wonderful ebay find, Heather! Sad, though, that it has ended up there instead of with family. I applaud your efforts to return it to relatives--such a family treasure! Good luck! I really enjoyed this post. Thanks, Beth! Until I find the family it is in good hands! This is a mitsvah -- good on you for doing this Heather! I hope it bears fruit and that you are able to post about the album finding its way home in the future! Thanks, John! I'm really hoping to track down the family. I did some Google searches and I think I have them tracked down but I'm not sure. Hopefully someone will come across this post! Jacob, so great to hear from you! I'll send you an email and we can discuss the album more. What a treasure...I'm glad we have been able to connect!